The 4th semester students of M.Sc. 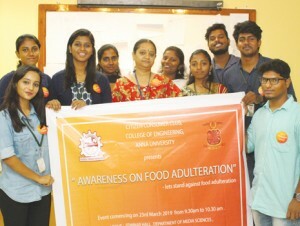 Electronic Media conducted a campaign today, titled “Awareness on food adulteration” at Anna University on behalf of the Citizen Consumer Club. The campaign was held at the seminar hall in the Department of Media Sciences. The main aim of this campaign is to bring a change in the attitude of people when it comes to food. Food adulteration is a practice that has been happening for a long time, but in recent years due to advanced scientific developments, finding out these adulterants has become very easy and many reports have been raised on this issue of adulteration in recent years.